Wine is the nectar of the gods. It is one of the oldest and the most expensive alcohol drinks known to mankind. I think nothing can be better than enjoying a glass of wine after a tough day. This wonderful beverage will widen your blood vessels and help relax your body. Many people have a habit of consuming wine every day. It fills their body with positive life energy and provides life contentment. My friends always say that a glass of wine every day can keep the doctor away. 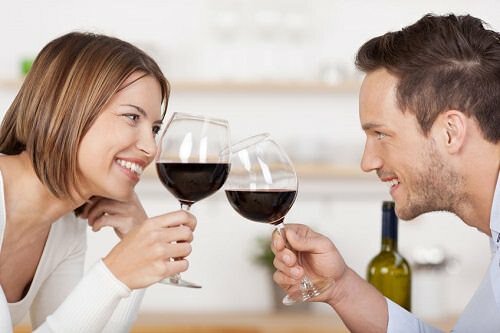 I couldn’t believe, but now I realize that wine consumption has a great number of benefits for both physical and emotional well-being. Drinking wine in moderation can boost your immunity and help you lose weight. Moreover, it preserves your memory and makes you more cheerful. This article will change your attitude toward wine. You’ll get to know how wine can make your life better. Just remember, moderation is the key here. Most people believe that drinking wine is the best relaxing way to develop and maintain a healthy gut balance because it has a big number of good gut bacteria. It may help your body digest food and prevent you from various diseases since there’s a direct link between digestive and immune system. Moreover, many researchers concluded that red wine consumption is extremely effective in decreasing pathogenic bacteria in the gut. Wine is rich in B-vitamins, beneficial enzymes, and omega three fatty acids. If you are still hesitating what beverage to choose during your meal, then try to drink a glass of red wine. Many wise people believe that the fountain of youth is filled with red wine because there’s an anti-aging compound that plays a great role in preventing cell aging. People who drink wine have more chances to live a longer life than those who prefer to drink beer or other kinds of alcohol. Wine includes resveratrol that stimulates different positive processes and chemical reactions in your body. Numerous useful substances found in wines can rejuvenate your body by activating chemicals that protect against age-related diseases. There’s no need to look for new and sophisticated methods to look younger if you can consume wine with pleasure but in moderation. According to the research, wine contains powerful antioxidants and essential vitamins. Red wines are more useful since they have the largest amount of antioxidants. If you don’t drink alcohol, you may receive a dose of these healthy substances by drinking a grape juice, which has similar antioxidant content. A glass of wine a day will help you relax your blood vessels and strengthen your cardiovascular health. Red wine is good for your heart since its healing qualities relax and stimulate your cardiovascular system. Moderation is a very important point if you decide to drink red wine daily. Be careful, because big amounts of alcohol can be harmful to your health. Moderate drinkers have a wonderful memory and productivity of their mental function. Furthermore, moderate consumption of wine prevents blood-sugar trouble and cuts the risk of colon cancer. Plus, it makes you emotionally balanced and happy. I think that wine is for savoring, not gulping. It can help you make a pause in your busy life and gather the circle of your best friends. It will break fears and help you socialize with people around you. Those who cannot drink wine should know an interesting thing. Scientists have claimed that thinking about a glass of wine can help you relax. It means that your thoughts can change your behaviors according to what you expect. The power of positive thinking can make miracles. Every time I drink wine, I feel the connection to the land and history of wine. I respect history and people who had dedicated their lives to the production of this wonder of nature. I have always dreamt of visiting a wine country and learn something about the ancient process of wine production. Nothing can be better than time spent with your friends somewhere in the middle of the wine country. It’s a great pleasure to enjoy the wine on the land where it’s grown and feel the warmth of the sun that throws light on the grapes. When I drink wine, I always feel fine. The wine has always been a symbol of joy and creativity. It releases endorphins which are the hormones of happiness. But you should be careful while drinking and having fun if you don’t want to suffer from a hangover next day. Wine is a majestic thing that can fill your life with joy, positivity, new acquaintances, and creativity. Furthermore, it can improve both your physical and mental health. You should consume wine in moderation if you don’t want to suffer from alcohol addiction, anxiety, and depression. Do you consume wine on a regular basis? What other interesting benefits of wine do you know?